We just returned from our annual trip to Peru. Saw wonderful things and acquired quite a few for the shop. 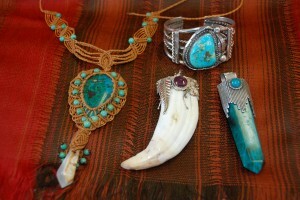 Here are a few of the jewelry items we have for sale. The macrame necklace has a gorgeous turquoise stone with a crystal drop at the bottom. The sterling bracelet with a big turquoise stone is American Indian made. The other 2 pendants have sterling and are very large. Come and see them in person and our other new Peruvian items in our shop in Lightfoot.